Before anyone insinuates that your cleaver is in any way violent, have a few innocent uses in mind. Remind any police officer who inspects your belongings and finds the bloody cleaver that plenty of chefs and butchers use cleavers. How does he know that you aren't just one of those guys? 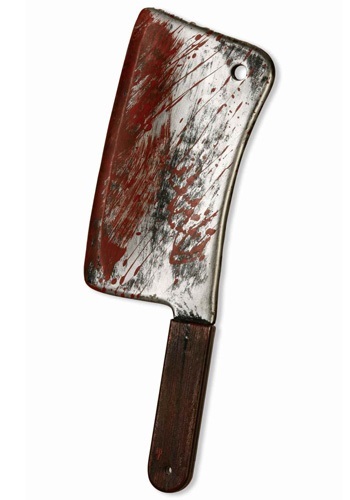 It's perfectly socially acceptable to have a bloody cleaver in your briefcase, isn't it? Well, maybe that conversation wouldn't actually go over that well. Policemen aren't usually known for their sense of humor. How do we know what's socially acceptable? We're selling bloody cleavers for goodness sake! This makes a sweet accessory for Halloween or for any zombie pub crawls you might be participating in. Just don't bring it to jury duty, even if you're trying to get out of it. You might find yourself getting a better seat in the courtroom than you bargained for.